(That’s an Adam Ant reference. Ask your dad if you’re too young to remember him). Yesterday was all about the war paint. Just like Adam Ant (asked your dad yet?) 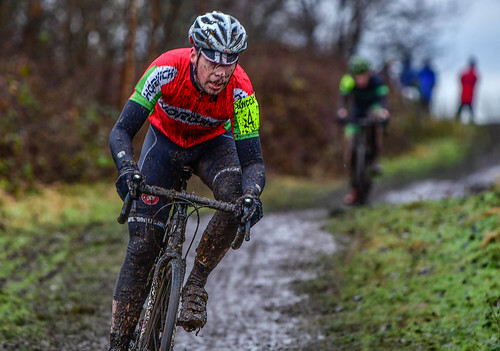 and his white stripe, everyone racing yesterday got a good covering of Knowsley’s finest mud. It was a modder for the youth races, a supermodder for the Vet 50s, an uber-supermodder for the Vet 40s and something as yet unclassified for us Seniors & Juniors. Off the start line your wheel rims disappearedinto the mulch and only reappeared for the brief tarmac section at the back of the course. The course, although not massively technical in itself, was great in the slippy, slidey, wheel sucky mud. Hard work all the way round, apart from the little road section, which was blissfully fast in comparison. I loved it. Slow going meant the riders in front where frustratingly close and yet minutes ahead at the same time and everyone behind you seemed to be right on your tail all the time. 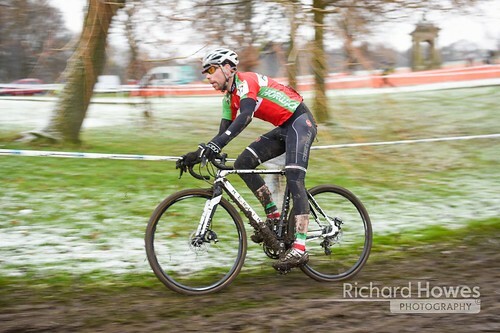 A revisit to Peel Park for a “the break in the NW league is too long” National Trophy race last weekend didn’t last all that long. Well, the day did. From supporting the vets at 10am right through to the elite mid afternoon race was quite a long day to be stood around in sub zero temperatures, made bearable by the sheer good attitudes and hospitality offered by everyone else from the North West. Everyone helps everyone else – even more so that normal – at thee big races. All in it together and all that. Brilliant. Not having a pass to get in the pits during the vets race mean I was reduced to hanging around in the jet wash area looking after clothes (by stuffing them in my coat as extra layers of insulation to keep warm…clever me 🙂 ) and helping wash bikes. (It was mostly about using other peoples clothes to keep warm though). A few pre race practise laps reminded me just how slippy the Bradford course is. Weirdly slippy. To the point where I started to convince myself it must have been built on the ruins of a industrial grease mine or something. Seriously, it makes no sense. Anyway, lined up in the middle of the pack at the start I got away half decently, managing to avoid a few over-excited crashes and making up a good few places round the top field. Feeling good. Past the pits, ready to keep working my way through the field and all of a sudden WHUMP! I’m flat on my back, after somehow hooking my bars round one of the very immovable wooden stakes holding the course fencing up. I’ve been flung off the bike, coming down hard on the back of my head. Hard enough to rip all of the webbing holding the helmet straps in place right out, leaving them flapping around my ears. Owch. It seems to take an eternity to get the bike unwrapped and get going again, bits of helmet flapping about so obviously I half expected one of the commisaires to end my race then and there. They didn’t though, so I started working my way back up from pretty much dead last. It took a lap or two to get back into it, but just as I started to get the lines and ruts ridden properly, as I crossed the finish line for about the 4th time I was ushered off the course under the “80% rule”. I’d ended up so far back from the leaders (who were still a good 5 minutes back from lapping me at this point) my race was ended after just over 30 minutes. Pretty annoying when you’re speeding up and in no danger of getting in the way of the front end of the race for at least another lap (I can see the point of the rule on a narrow of congested course, where you could end up ruining a last lap sprint or something). Oh well. At least no bikes got broken this time! Next up – Stadt Moers. Probably not as greasy.